Deutsche Telekom had 3.024 million TV customers in Germany at the end of June, up 8.9% year-on-year, and up 2.3% quarter-on-quarter. The figure meant that Telekom’s Entertain service passed the three million milestone for the first time during the quarter. The operator said that its service was the only IPTV platform in the German market that posted growth during the period. For the rest of Europe, the telco had 4.156 million TV customers at the end of the second quarter, up 4.9% year-on-year and up 1.4% quarter-on-quarter. In total, Telekom added 56,000 new TV customers outside Germany during the quarter. The group said that it had successfully marketed fixed-mobile bundles, with 175,000 additions in the three months to June. TV customers for Hungary’s Magyar Telekom topped one million for the first time, ending at 1.006 million. While the number of satellite TV customers dipped slightly in the second quarter, cable customers frew modestly and the number of IPTV customers increased from 571,169 to 590,869. Makedonski Telekom in Macedonia – an operating unit of Magyar Telekom – had 112,436 TV customers at the end of June, up from 110,797 in the previous quarter. 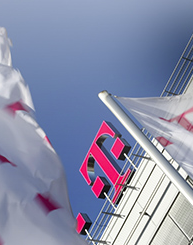 Deutsche Telekom’s Croatian subsidiary, T-Hrvatski Telekom, had 411,000 TV customers at the end of June, up 5.2% year-on-year and up from 391,000 for the previous quarter. However, TV ARPU was flat year-on-year. T-Hrvatski Telekom was the first of the group’s company’s to adopt Telekom’s next-generation TV platform. Crnogorski Telekom, the Montenegrin operator that is a subsidiary of T-Hrvatski Telekom, had 58,000 TV customers at the end of June, down 6.4% year-on-year. Overall, Telekom posted revenues of €18.9 billion for the quarter, up 5.9%, and adjusted EBITDA of €5.944 billion, up 8.2%. “Our record investments are paying off: Growing numbers of customers are choosing our networks and products. And revenue and earnings are lifting substantially on the back of this strong customer growth,” said CFO Thomas Dannenfeldt.